Dolomite has over a century of experience in developing and producing the best outdoor footwear and apparel. Our roots are in the Dolomite mountains and, together with our Italian design and style, they inspire our brand and products. We have a passion for the mountains, the outdoors and lifestyle. With over a century of history in manufacturing and designing footwear for the mountains and for the great expeditions that left their mark on the history of mountaineering, Dolomite has acquired a unique wealth of knowledge, which we apply with experience and determination to develop innovation and new technology. The Dolomite shoe factory began operating in 1897. Giuseppe Garbuio, who was only 17 years old at the time,opened the Fabbrica Scarpe Montello store. 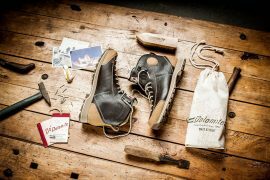 In 1954, when an Italian expedition set out to conquer K2 in the Himalayas – one of the most dangerous peaks in the world – they were equipped with Dolomite boots. In 1960 a Swiss expedition conquered Dhaulagiri, the White Mountain, the seventh highest peak in the world. In 1966 the Italian Alpine Club of Carate Brianza and Gruppo Ragni of Lecco reached the 71° Parallel North in Greenland. These major expeditions gave the brand international visibility and other important expeditions followed. It is to these extraordinary traditions that Dolomite owes its unique knowledge and experience, which you still find today in our collections.